Technology designed to help drones avoid mid-air collisions is helping the British cycling team's BMX squad speed up their lap times. BAE Systems has partnered with the team to adapt its sense-and-avoid system for use on bicycles. It consists of two miniature infrared lamps fixed to the bicycle frame which are monitored by sensors at the side of the track. As the cyclist passes the sensor, the lamps leave a trail that shows their trajectory - either through the air after a jump or on the ground. Previously, the team had used timing loops buried into the ground, but this system offers much deeper insights into how cyclist speed changes as they pass a jump. 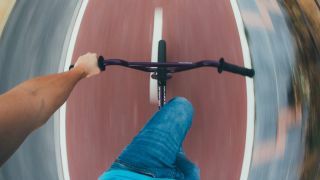 "In an elite sport such as BMX, where riders are travelling around 40kph and spending more than 40 percent of the race in the air, every millisecond counts and one imperfection for your form can put you at a disadvantage," BMX squad member Liam Phillips told the BBC. The team hopes that the data that the system gathers will be able to improve the team's performance ahead of the Olympic Games in Rio de Janeiro in 2016. Phillips added: "[This] will revolutionise the way we train, allowing us to analyse our techniques with a new-found precision."